When you drive five hours through traffic on I-95, you hope that you’ll be able to accomplish what you set out to do. However, with lightning and thunder predicted for the morning of the race, the Landaus were not optimistic that they would have a chance to compete at the Kinetic Multisports Super Series Tidewater Sprint this past weekend at Buckroe Beach in Hampton, Virginia. Safety-minded Race Director Greg Hawkins discussed the options at the pre-race meeting at the packet pick-up on Friday evening. He told participants that if there’s lightning and thunder, there is no race. The safety of participants is paramount. 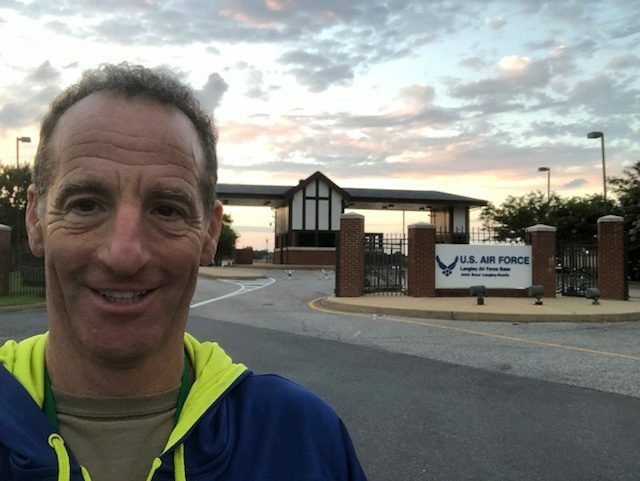 Attorney Doug Landau was familiar with this race course from having done the event once before, and from spending time at Buckroe Beach when his son was stationed at both Langley AFB and Portsmouth Naval Station, as part of his military medical service with the United States Navy. Luckily, while skies were foreboding and overcast and the waves three to four feet high, the race started as scheduled. Race Director Hawkins shortened the swim in a concession to the weather conditions. While the roads were wet, plenty of terrific volunteers were on hand to get swimmers, bikers and runner safely home. 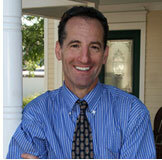 Lawyer Landau battled the waves and was never able to get into a good swimming rhythm for this race. His disjointed swim put him over 80th position before a quick transition put him back in the hunt. Passing other cyclists throughout the 2-loop bike course, Landau was pleased to average 20 miles per hour and stay upright. During the last hairpin turn on the causeway, Landau’s rear wheel did an almost 360 degree turn while the front wheel stayed stationary! While the volunteers cheered that maneuver, he hopes to never repeat it again.Another quick transition enabled him to pass runners out on the course, despite the rain and wind. The only racers to pass him on the course were two collegiate relay members. Landau’s running speed was just over seven minutes per mile, not fast enough to contend for a podium spot at the National Championships in three weeks, but a solid performance nonetheless. Landau believes he is over the leg injuries that have plagued him the last several years, and he seems to be fully recovered from the pneumonia that took him out of contention in March and April. As a result of completing this third face overall VTS/MTS, or Kinetic Multisports, Super Series championship points, Landau is on his way to being “in the mix” for a Series prize. As a result of completing this third race, his overall Series points currently puts him in 10th place, out of some 200 competitors in his category. The Kinetic Multisports Super Series rules allow competitors to compete in as many races as they like. They can use their best points from five races. The longer races are given more points, so Landau, as a sprint triathlon specialist, is it a disadvantage. Some competitors in his category have raced more than six times! Lawyer Landau hopes that if he completes two more races with podium finishes, he will again be in contention for the top prize in his age group. He will not be competing in any Kinetic Multisports Series races until late September and early October in order to focus on the National Championship in Cleveland, Ohio this August. Will his strategy of racing himself into shape over the last two months work after getting over pneumonia in April? Stay tuned!